With the many online dating site niches today, one of the most sought after is the wealth dating sites for the obvious reasons. This may be the reason why more and more wealth dating sites are popping on the internet today. One of the best wealth dating sites is MillionaireMatch that connects both single men and women. Find out more about it by reading the information provided just for you below. MillionaireMatch was established in the year 2001 and has earned its credibility and reputation over time. This online dating site is designed for attractive and successful singles. Majority of its members are known personalities, professional models, Hollywood celebrities, CEOs, lawyers, and as well as doctors. 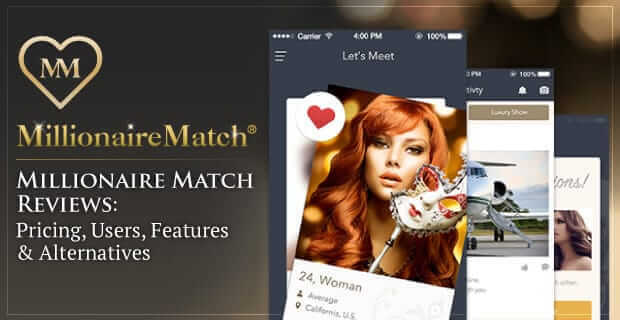 MillionaireMatch is the first and biggest wealth dating site today and has been featured on CBS, ABC, and CNN. Due to its fantastic reputation, the site has now a total of 3 million members. Members at MillionaireMatch are required to verify their income, but the site makes sure that its privacy is given utmost importance. This may also be the reason why celebrities are choosing MillionaireMatch because of the privacy that the site offers. To ensure anonymity, there is exclusive access for members. As mentioned above, MillionaireMatch caters to people who are attractive and successful. If you are someone who is successful, then you should join MillionaireMatch to find likeminded people. They have been in this industry for 17 years now, and they have given a place for singles to meet up with each other successfully. Another reason why you should choose MillionaireMatch is that every 2 to 3 years, they have been launching a new feature to ensure that their members are getting the best experience that they deserve. Due to these regular updates, MillionaireMatch gains good reviews and success stories. Also, the majority of the members are from the US and their age range from 35 to 54 years of age. There are also more men than women, but both are active when it comes to Members Luxuries page and Forum and Blogs. The site’s staff reviews every profile on MillionaireMatch before they become available online. Signing up on MillionaireMatch will only take a maximum of 10 minutes. But of course, it will depend on how you quick you answer everything about yourself and the kind of person that you are looking for. The first thing that you need to do is to give your necessary information, including your first name, email, age, gender, and the gender that you’re looking for. You also need to provide a username and your preferred password. The next step is where you will include some personal information including your relationship status, ethnicity, body type, height, annual income, zip code, and the country you’re in. Once done, you can upload a recent photo of yourself, and this will become pending until it gets approved. The last step would be the part where you’ll write a paragraph describing yourself and the person that you’re looking for. This part will only require a minimum of 50 characters. To fully access all the features, you need to verify your email. The members’ luxuries feature is where members can start posting photos of their expensive belongings. It may be a car, a watch, a house, or even their different properties for as long as the things that they will post are theirs. This feature will help you get ideas on first dates, and these ideas are from members itself. You can respond to any of the posts there and initiate a conversation. Of course, you can also ask questions that you have in mind. The forum is where conversations and questions can be done. Some members who are too shy to send a message to someone they like usually get encourage here. You can ask a question and hope that the person that you like will answer it. Members who love writing can post blog entries depending on the topic that they please. You can check the blog tab where the most recent posts can be seen and as well as the authors for each blog posts. Overall, MillionaireMatch will surely help you achieve your goal of meeting someone who is successful and as well as attractive. The good thing is, you don’t have to worry about getting scammed because the site has a verification process that members need to do before actually becoming a member.